Welcome to the Kiln Drying Page! Here at Metsami Creations we operate a wood kiln capable of handling up to 2500 board feet of lumber per run, a boards up to 14′ long. The kiln is wood fired and contains air movement and dehumidification systems. At this time the kiln is being operated for personal use as we perfect the drying process. Currently all air handling, heating, and dehumidification systems are manually controlled, so the kiln has the tendency to dry the lumber too quickly. We are working on developing a complete custom and computer controlled system to maintain proper humidity and temperature to ensure proper drying. The temperature of the kiln can be maintained anywhere from 90 to 160F for different operations such as slow drying, pitch setting, and insect elimination. Drying white pine and birds eye maple. 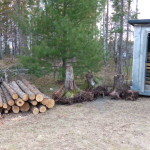 Kiln and piles of cedar logs and stumps. 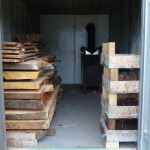 White pine slabs and worm castings drying in kiln. 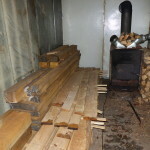 What are you prices for kiln drying how long does the boards need to be cut before you will take them to be dried?